She was a warrior worth a thousand, ready to confront a demon or a god, mounted or on foot. 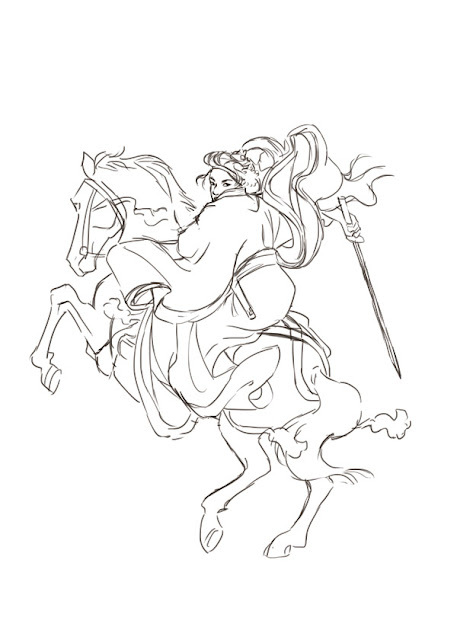 She handled unbroken horses with superb skill; she rode unscathed down perilous descents. 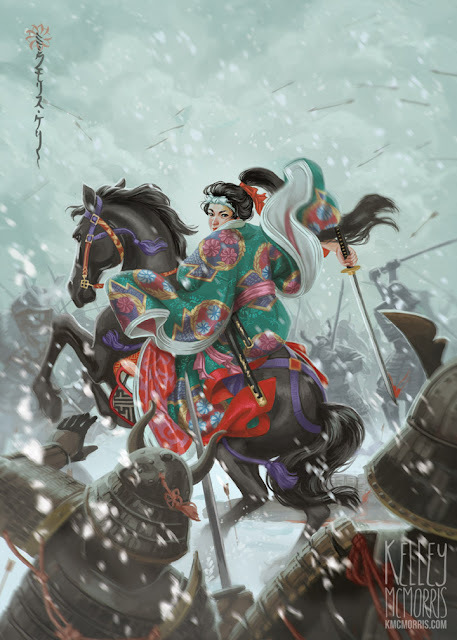 Whenever a battle was imminent, Yoshinaka sent her out as his first captain, equipped with strong armor, an oversized sword, and a mighty bow; and she performed more deeds of valor than any of his other warriors. Did you know that the name "Kelley" means "warrior"? It's true. And it's pretty undeniably cool, if I do say so myself. (Thank you, Mom and Dad!) 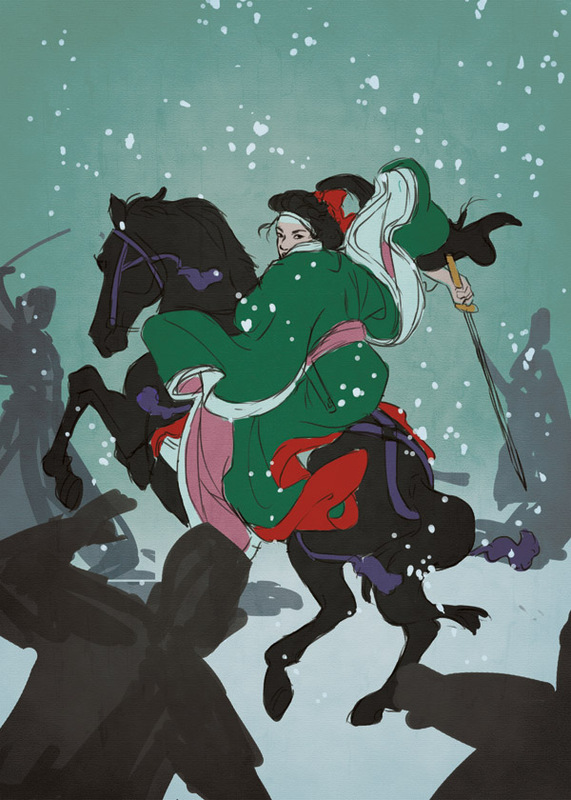 My whole life I've been looking for more stories of female warriors. When I read Lord of the Rings in high school, I became absolutely obsessed with the character of Eowyn. Besides her and Disney's Mulan, I can't remember any other female knights or female warriors that I encountered in movies or books. That's why, in 2014, I was particularly excited to hear about an art project that was looking for artists to draw knights. It's called 1001 Knights, and it's a collective art anthology organized by Annie Stoll and Kevin Jay Stanton. 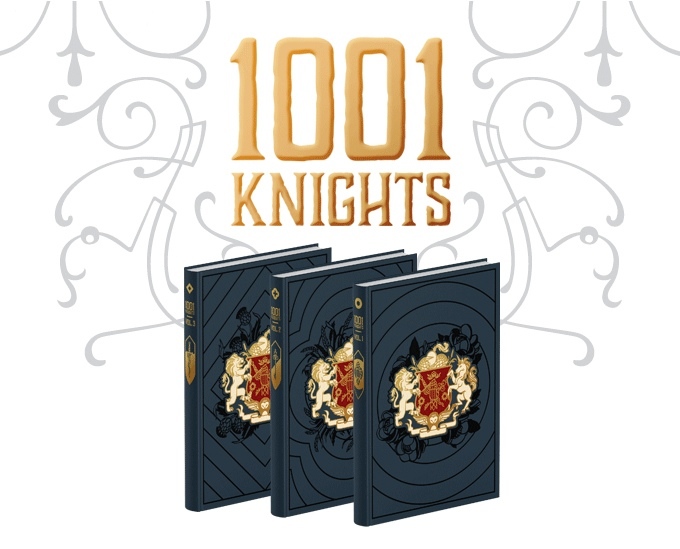 It's an incredibly ambitious project, featuring one thousand and one drawings of knights, by 250 artists, spread out over three beautifully bound hardback volumes. The theme that ties the volumes together is that anyone who embodies the virtues of a knight - courage, wisdom and fellowship - can be a knight. It is so cool, you guys. Go check out their Kickstarter to grab your own copy - one of the reward tiers includes a print of my illustration above. So, let me tell you about this knight I drew. 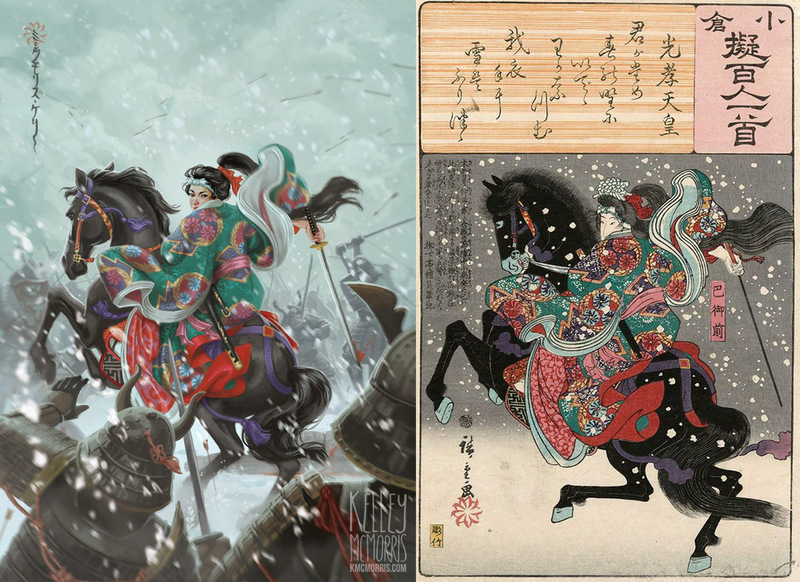 Tomoe Gozen was a real-life samurai who lived and fought during the late 12th century. Her life is mostly shrouded in legend, and even the legends disagree with each other. For example, some sources say that she died by committing seppuku, others that she walked into the sea carrying the head of her fallen master, others that she retired and became a nun. 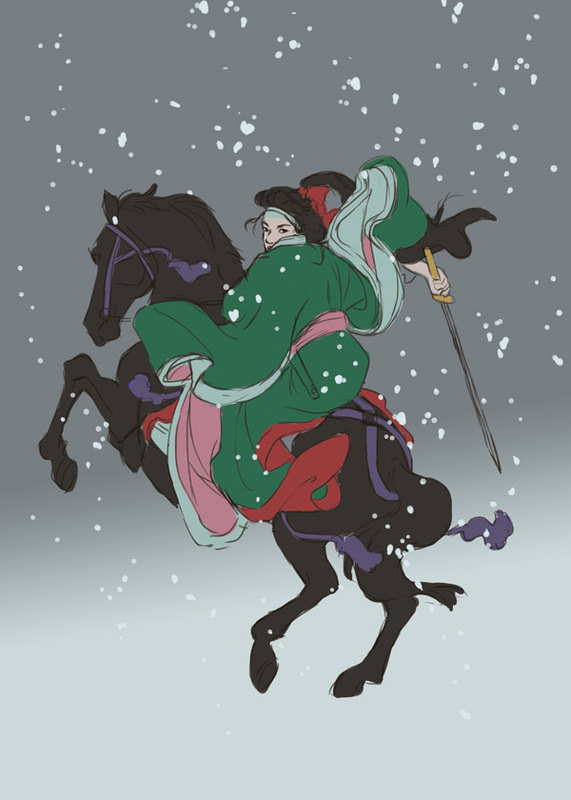 But they all agree that Tomoe was an exceptionally brave and beautiful warrior. In paintings she is often depicted with long, flowing hair, wearing a white headband and riding a rearing horse. 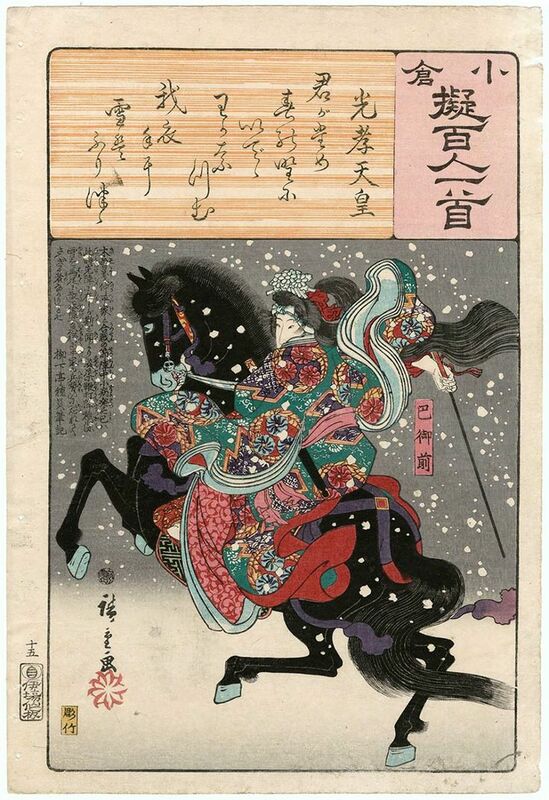 This beautiful print by the famous Hiroshige was the inspiration for my painting. I loved the fluid lines and the movement in this drawing. I wanted to draw it in my own style, so I just dove in, not really knowing what I was going to do but super excited to do it. I traced the outline of Tomoe straight from the print; however the horse's pose needed a little tweaking. His anatomy in the original print is a little wonky. At first I stuck really closely to the original print, but it felt kind of bland. I'm not as master of understated simplicity like Hiroshige. I always have to add a scene with some narrative to it, so I started scribbling in a battleground. Things just got worse from there. A full-on war and snowstorm started raging! I spent a lot of time on this painting; I estimate maybe 30 hours or so. 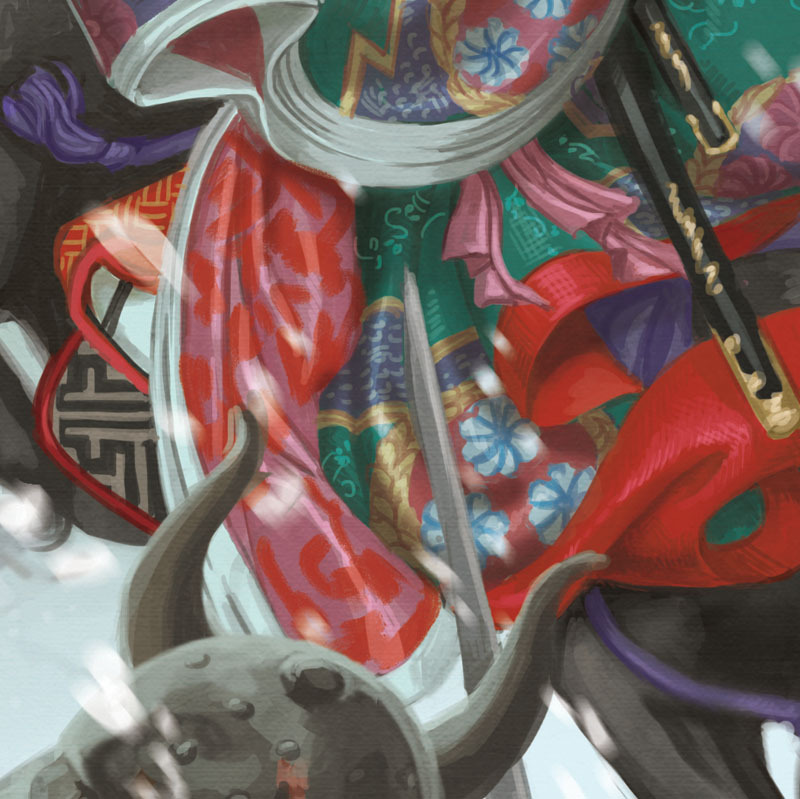 I was really relishing adding intricate details to every part of the scene, but especially Tomoe's kimono. By the way, that's my name in Japanese in the corner. It says "Mikkumorisu Kerii." That single Japanese calligraphy class I took in college has finally come in handy! I'm really proud of this drawing, and I'm honored that it was chosen as one of the print rewards for 1001 Knights. Again, go check out the project, and please spread the word! The world needs more knights! So great to see you add your naturalism and narrative to an Asian scene. 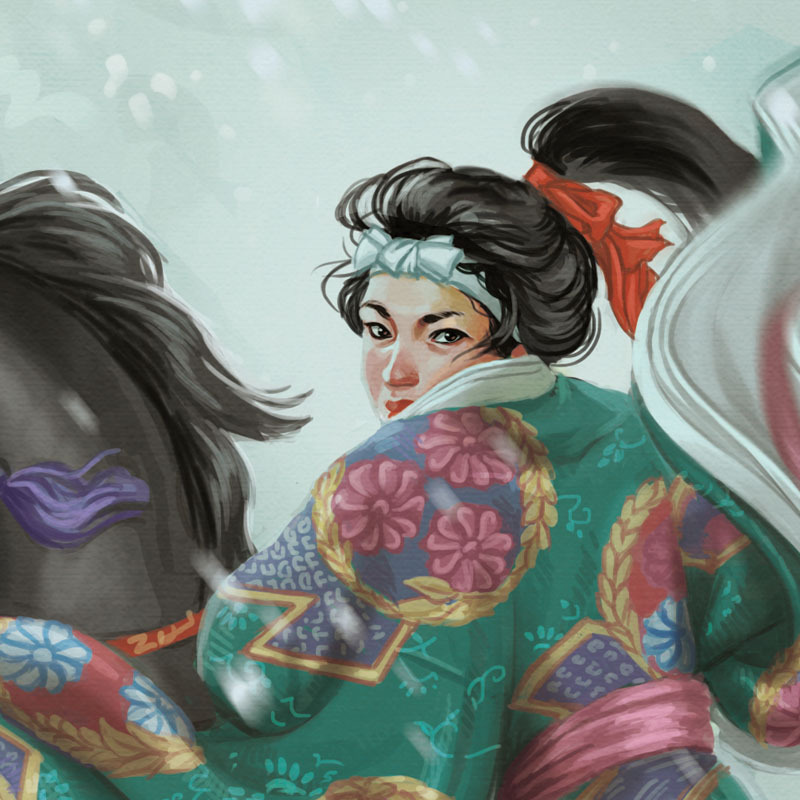 The original print is great, but her kimono in your painting is amazing. I wondered how Japanese prints would look in realism, and now I know. Gorgeous!